Visitors to Munich looking for specific recommendations on where to go to enjoy a beer are likely to encounter a very unique problem: trying to find a bad beer in Munich is like trying to find a very small needle in a very big haystack! This means that an excessive number of recommendations are likely to be received and the visitor will perhaps be more confused after receiving recommendations than before. 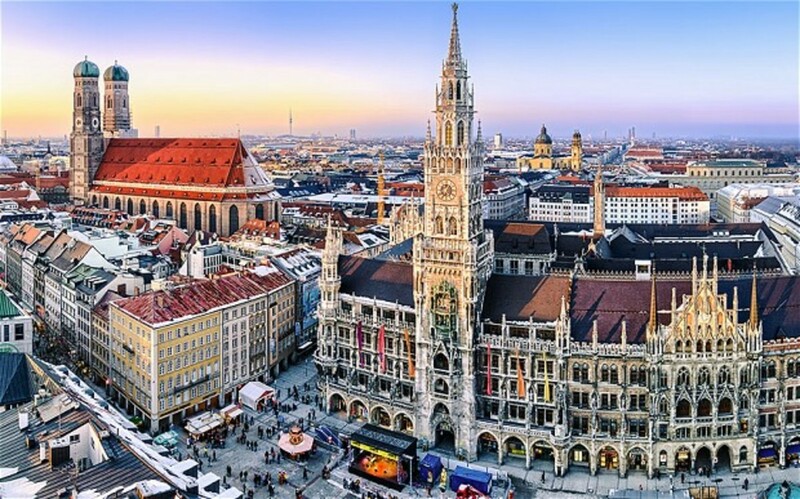 What it is feasible to do, however, is examine the very different types of place it is possible to go to enjoy a beer in Munich and proceed in that logical fashion. This site will look, therefore, at specific, representative examples of the different kinds of beer selling establishments in and around Munich. 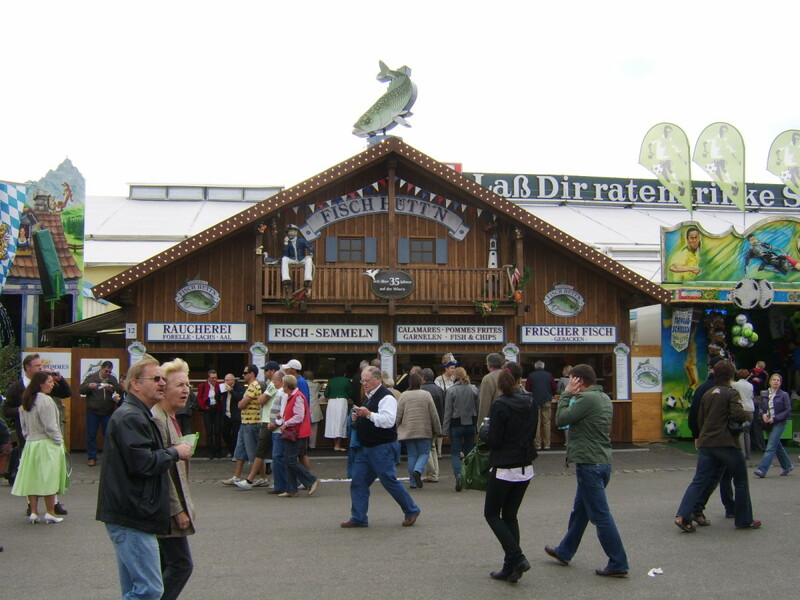 It will look at the biergartens , the large beer halls...and of course, at the world's biggest party, Oktoberfest ! Do remember, however, not to ignore the smaller establishments altogether, as what they offer can frequently be every bit as good. Before looking at the types of places to enjoy a beer in Munich, it makes sense to briefly examine the beer itself. The beer produced in Munich and throughout Bavaria remains subject to the 16th Century Beer Purity Laws, which among other things state that beer must not include anything other than the most basic, essential ingredients. This means that to this day, you will not find chemical additives of any type in beer produced in Munich. The beer (bier) which you will find in Munich comes in a number of broad categories. The three mentioned here are the most common. This is the type of beer which will look most familiar to visitors to Munich from such as North America, the UK, Australia or New Zealand. It must always be remembered, however, that it is likely to be considerably stronger in terms of alcohol content than the similar looking beers such visitors are used to at home. It should be noted thet weiss is a word with a double meaning in German. It can mean, "White," but also means, "Wheat" - as is the case with beer. 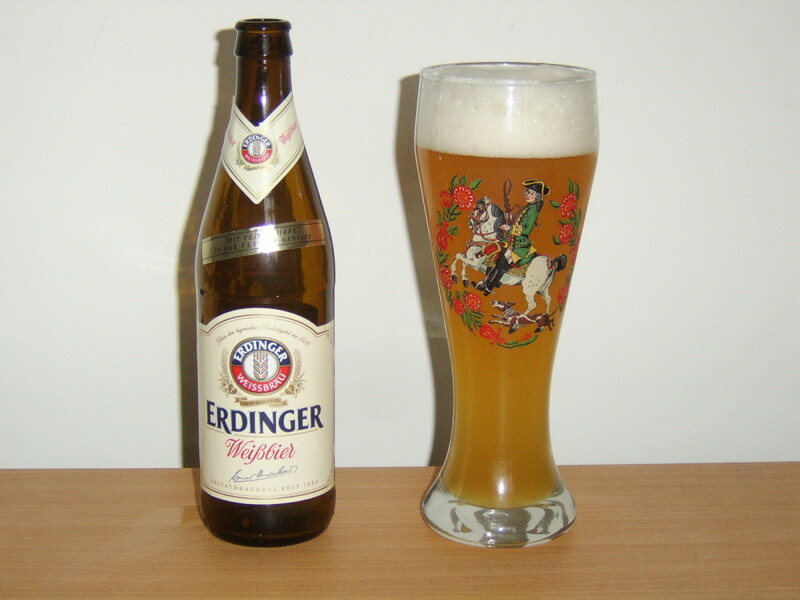 It is a common reaction among those sampling it for the first time to think that weissbier is cloudy. It is and it is supposed to be - the yeast is not filtered out. 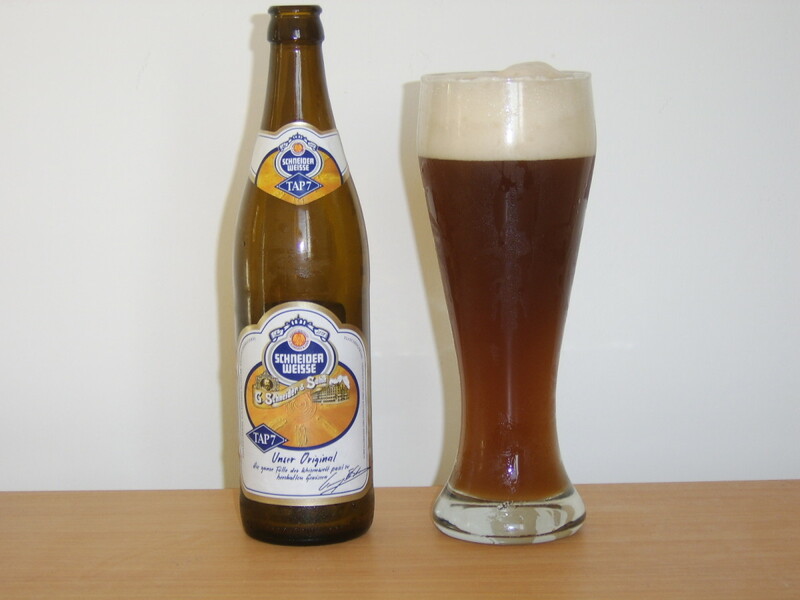 Dunkel weissbier is simply a type of weissbier produced with darker grain. Weissbier is generally much smoother than helles beer and particularly dunkel weissbier has a delicious, almost caramel like taste which is most addictive! Taking the time to try all three of these genres of beer - though not necessarily all in the same sitting! - will allow you to suit their very different qualities to your specific tastes and further enhance your enjoyment of Munich and its truly magnificent beers. The biergartens (beer gardens) of Munich are of course legendary and they can be found in profusion, in many different forms, all around the city. 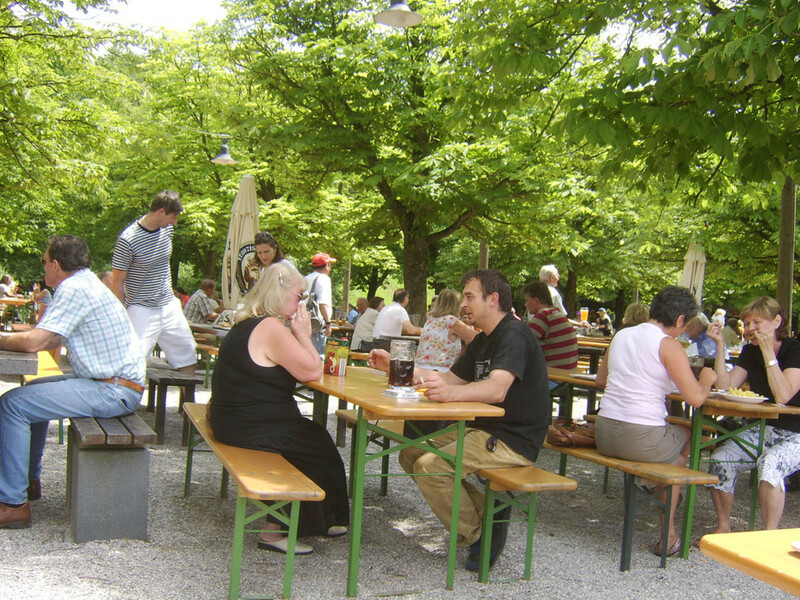 The biergartens which are contained in Munich's large public parks are, however, among the most popular with residents and visitors alike. 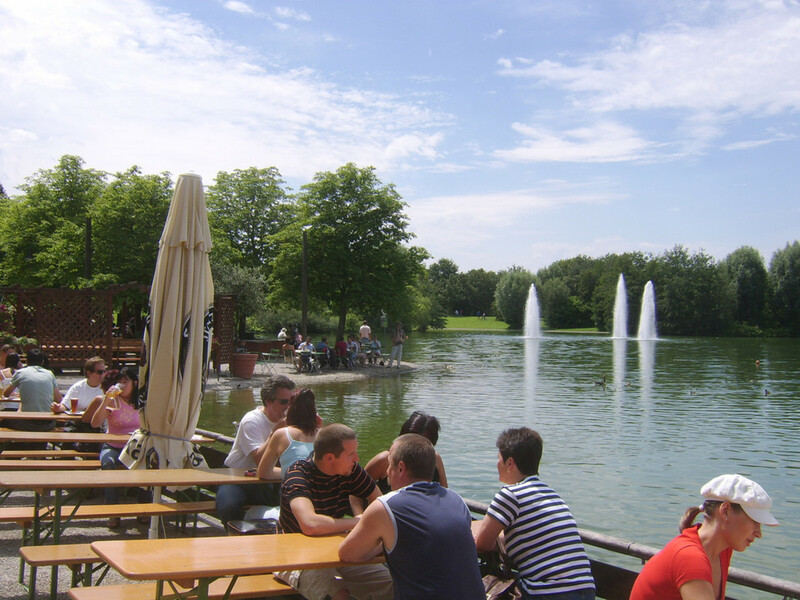 Probably the most famous park of this type in Munich is the Englischer Garten (English garden,) which is located within the city and is the largest fully contained urban park in the world. If, however, you are prepared to travel just that little bit further, there are many more, less well known but just as appealing such parks on the outskirts of and just beyond Munich. One such park is the Ostpark and its fabulous Michaeligarten makes it more than worth the short trip out to the East side of Munich. The Ostpark is best reached from the centre of Munich by taking the U-bahn to Michaelibad . (Note that if you do happen to exit the station and clearly see that you are on the wrong side of the busy road, it is simply a matter of walking through the underpass to the other side.) 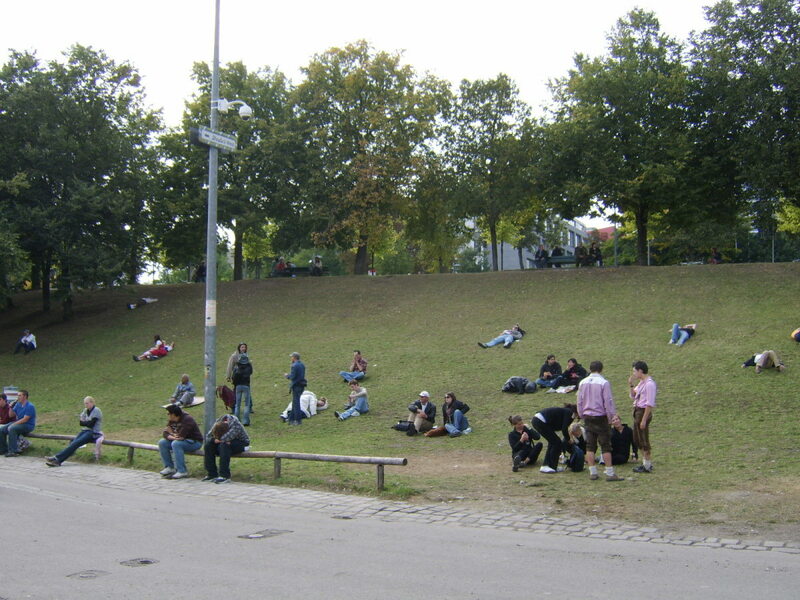 The Ostpark can be entered virtually from the station but it is a ten or fifteen minute walk to the Michaeligarten . All drinks and food in the Michaeligarten are purchased from a vending area straight ahead upon entry. The purchases from the different stands are gathered on trays and paid for collectively at the point of exiting this area. Visitors then simply have to find a table and a seat - something which can be easier said than done at particularly busy times on warm days. If at all possible, try to obtain a table by the lake. You may be surprised by the fact that it is not only the ducks and swans which will come in search of tidbits - the huge carp in the lake will do likewise! 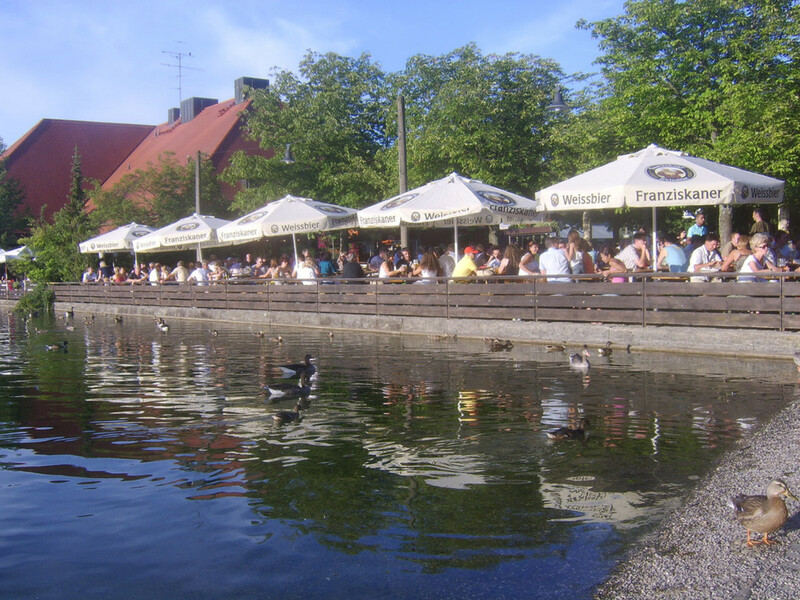 Important note: Biergartens such as Michaeligarten are often seasonal and only open in the summer months. They may also fail to open without warning on days when the weather is particularly inclement. 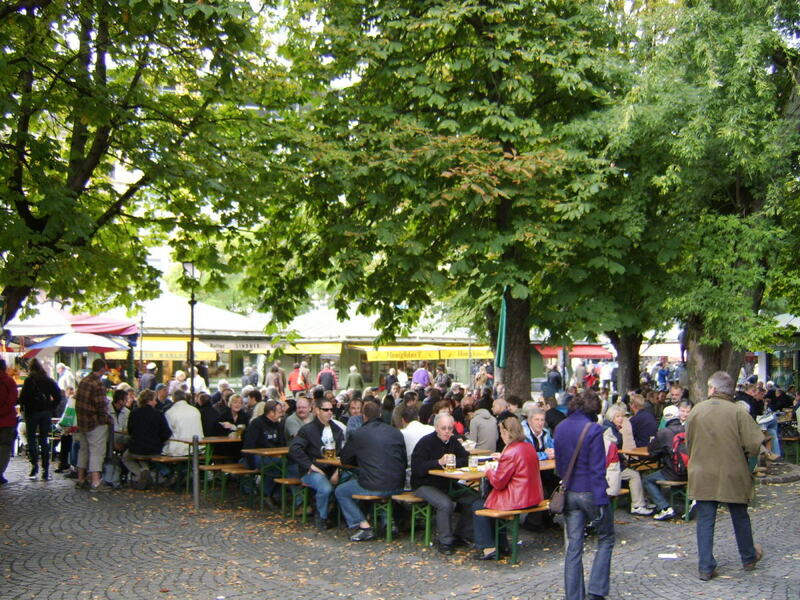 The mistake should never be made of thinking that biergartens in Munich are confined to the large public parks. 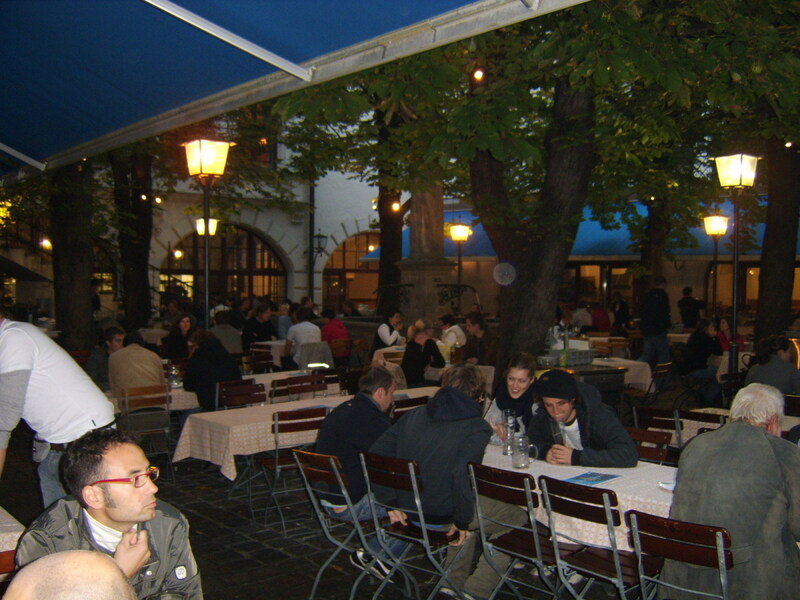 There are biergartens to be found of all types in and around the city. 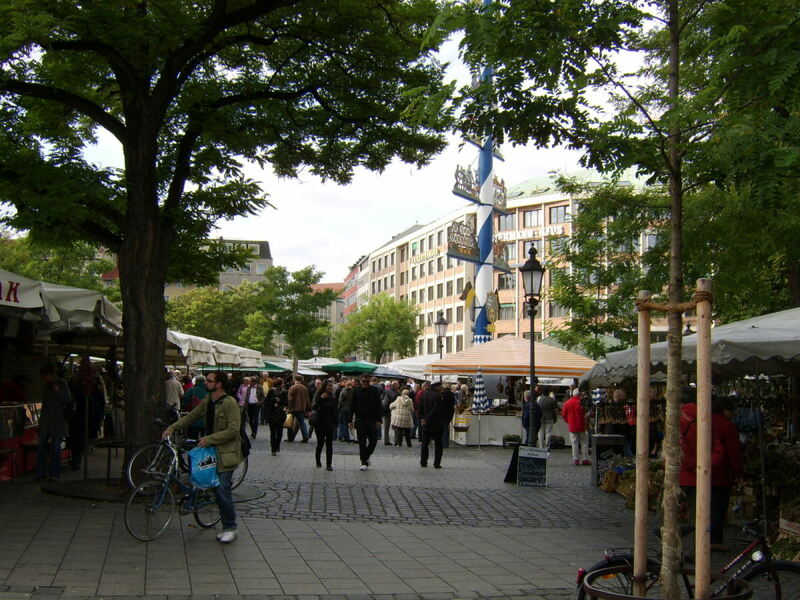 The Viktualienmarkt is a fairly large, outdoor market, a mere five minutes' walk from Marienplatz, Munich City Centre. 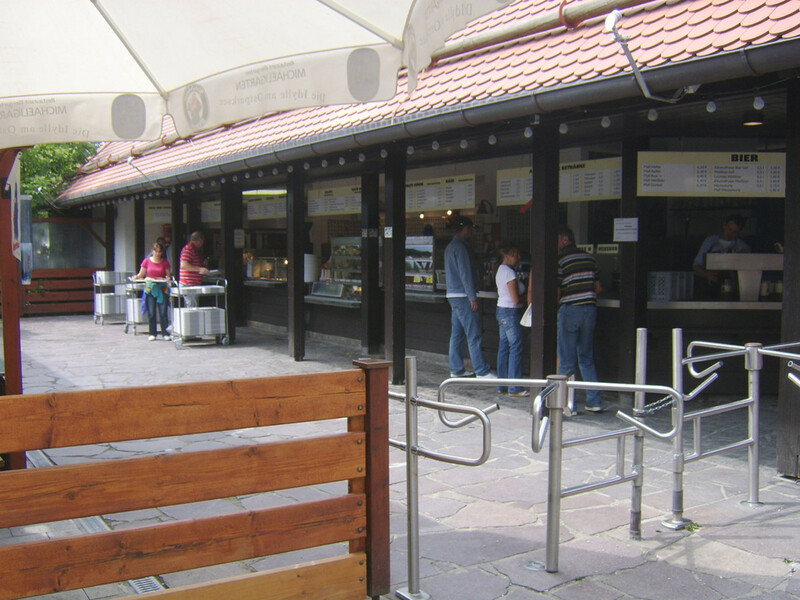 The market sells chiefly foodstuffs from tented stalls but also has a moderately large biergarten, contained underneath the traditional chestnut trees so often associated with the biergartens of Munich. There are two types of tables in the Viktualienmarkt biergarten. Those with table covers include waiter/waitress service but the drawback here is that you can only eat the food at the table which you have purchased from that supplier. It is much more fun to select a table, go and get your own beer and leave someone to watch the drinks while you browse the many foodstalls to make your own selection and bring it back to your table. It is worth giving a small word of warning about sitting under the chestnut trees in biergartens. The benefit is that they will keep you dry in the event of light rain or will shade you from the sun. If, however, you are sitting in such a place in the late summer or early autumn, beware of falling objects! It does happen and chestnuts often land on the heads of drinkers - or even worse, in their beer! There are many breweries in Munich and most of the larger ones have their own beer hall, a vast retail outlet where they sell their product to customers. 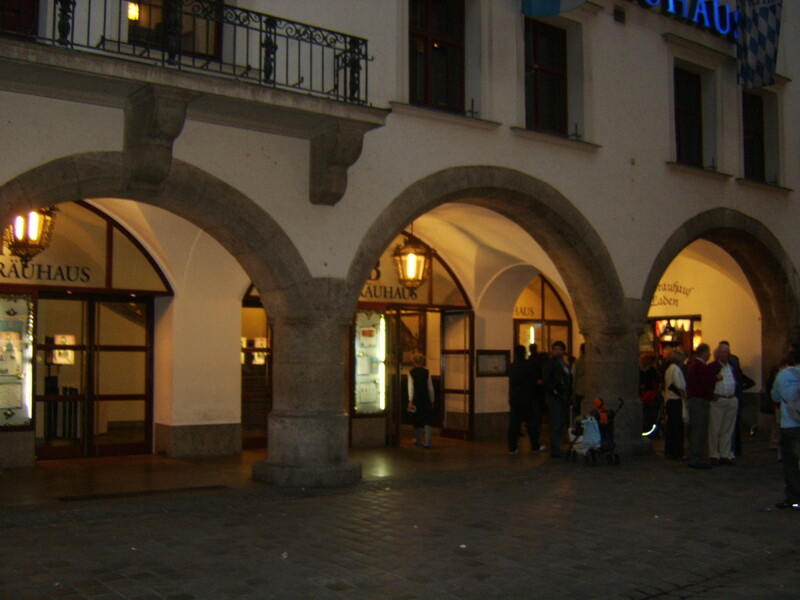 The most famous such beer hall in Munich is the Hofbrauhaus, located no more than ten minutes' walk from the Marienplatz. It should be noted that the biergartens of Munich mentioned earlier are likely to be frequented by both locals and visitors alike. 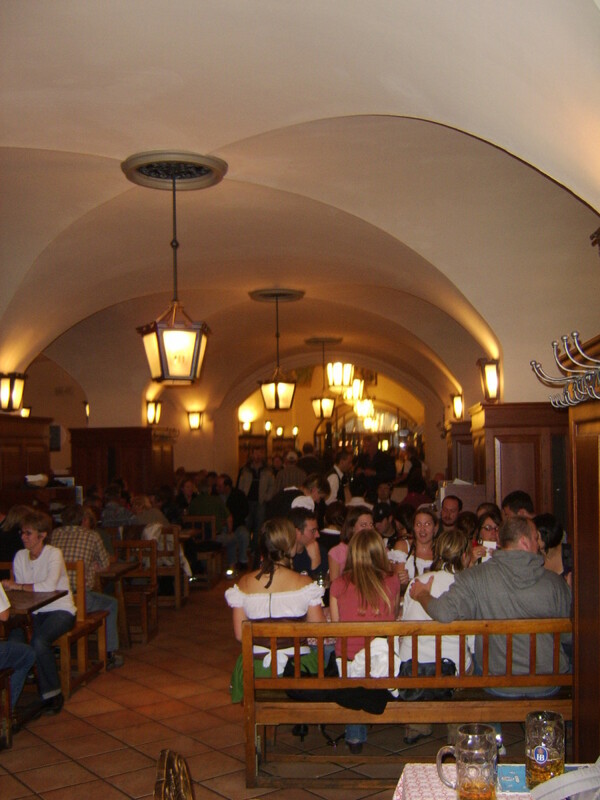 When visiting a place such as the Hofbrauhaus, however, you will find that it caters very much for the tourist clientele. 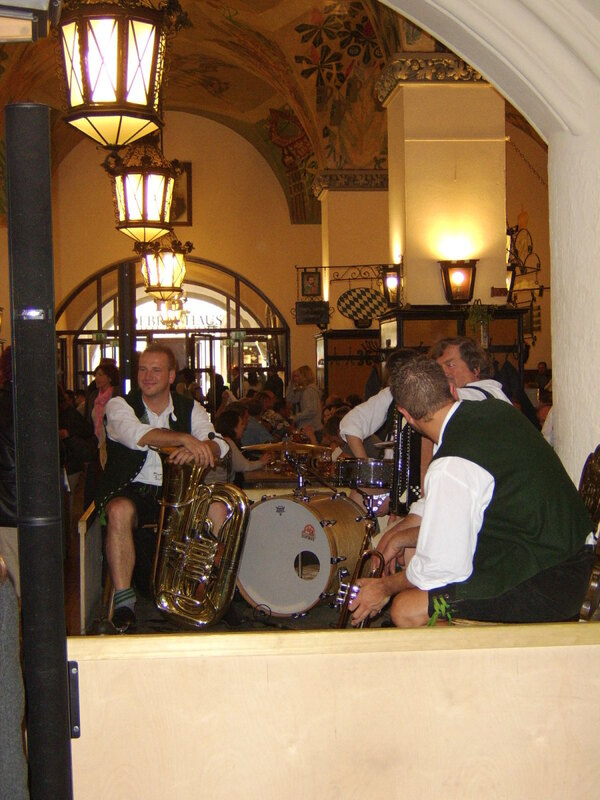 You will find your servers dressed in traditional Bavarian costume and the band plays traditional Bavarian music for most of the day. The atmosphere is fantastic but it can be extremely loud and it is most definitely not the sort of place to go for a quiet evening. Note also that all tables in the Hofbrauhaus are waiter/waitress service. Each one also has its own designated server at any one time, so there is no point attempting to attract the attention of another if yours is busy: you will not be served. 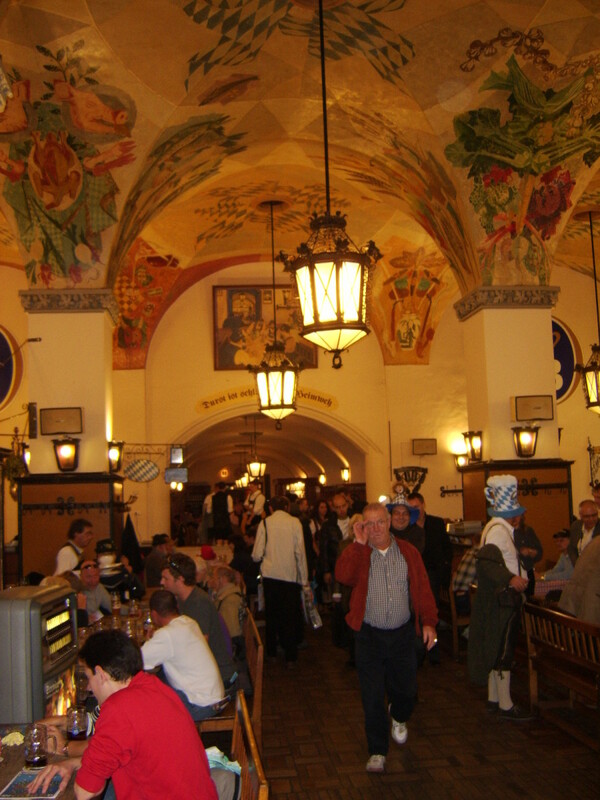 It is vital to visit a place such as the Hofbrauhaus at least once during your Munich trip in order to obtain the most rounded experience. One of the drawbacks, however, of it being geared towards the tourist industry is that its prices are likely to be notably higher than other establishments in the vicinity, both for food and drink but especially for souvenirs. 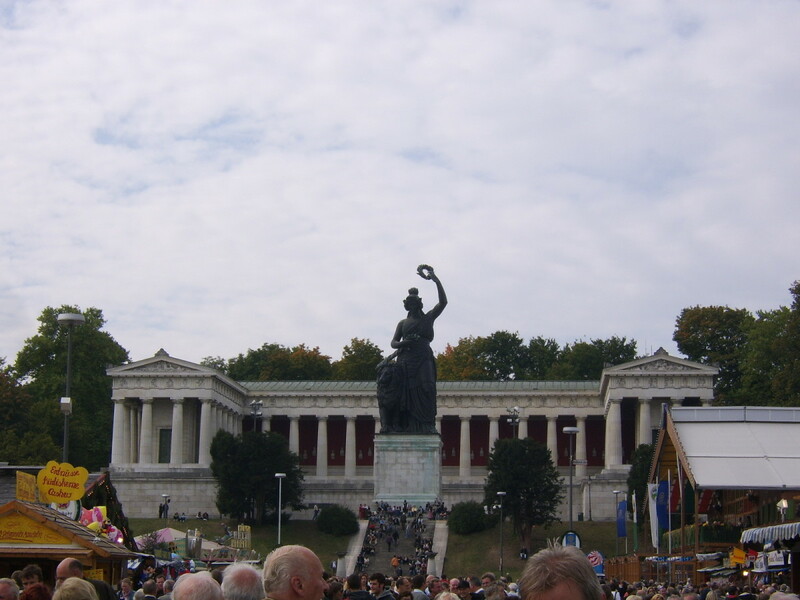 There is no way of course to write about Munich and beer without mention of the world famous Oktoberfest. 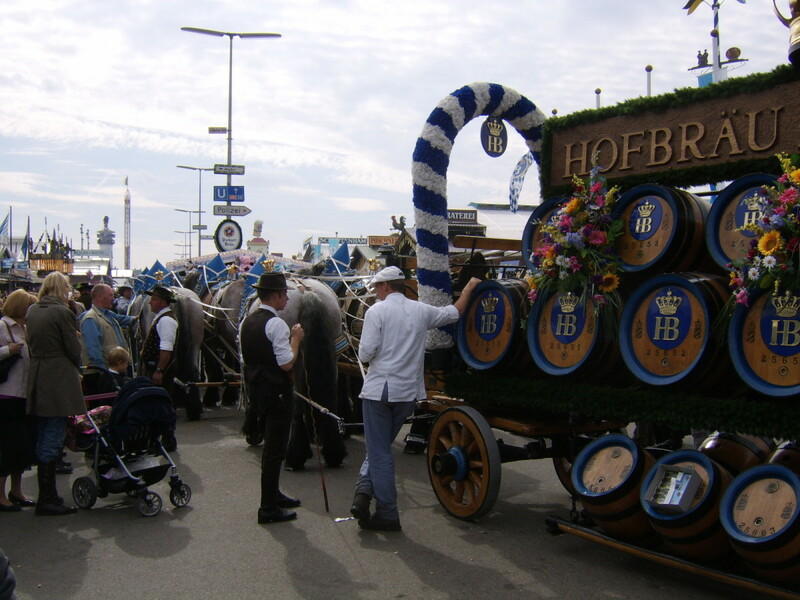 Although it only lasts for just over two weeks every year in late September/early October, Oktoberfest is what most people from outwith Germany associate with Munich more than anything else, or at least what they associate most with Munich's beer. 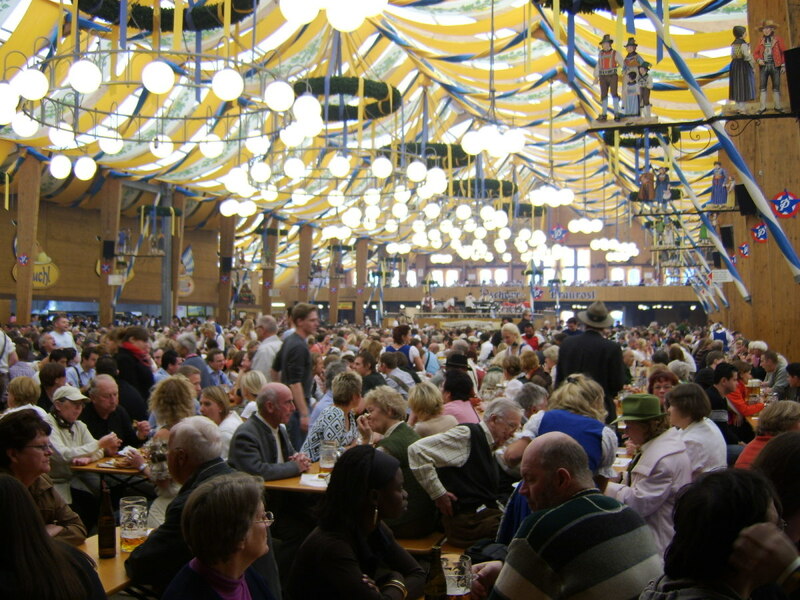 Oktoberfest is often branded as the world's biggest party and few who have ever visited would be inclined to disagree. 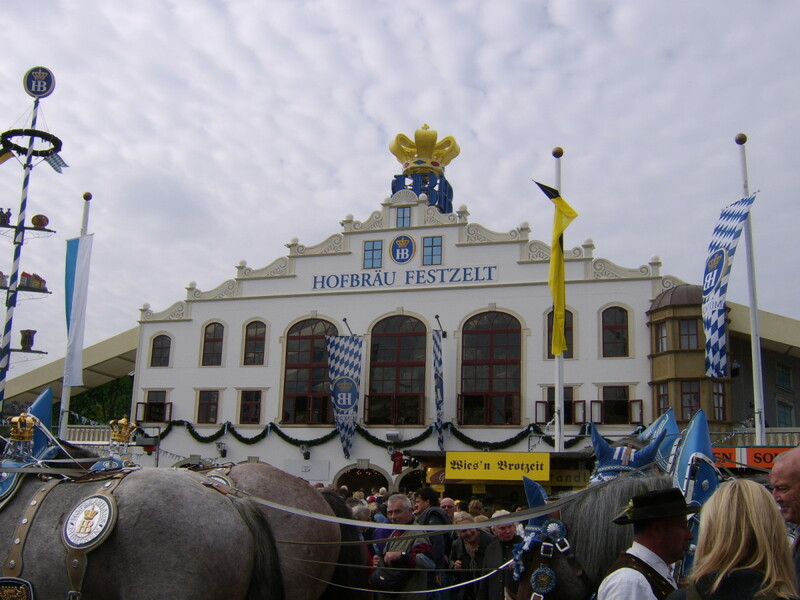 The vastness of the site alone - it is virtually a small town within the city - and the number of visitors who attend it every year means that Oktoberfest stands alone in a celebration of beer and its associated culture. 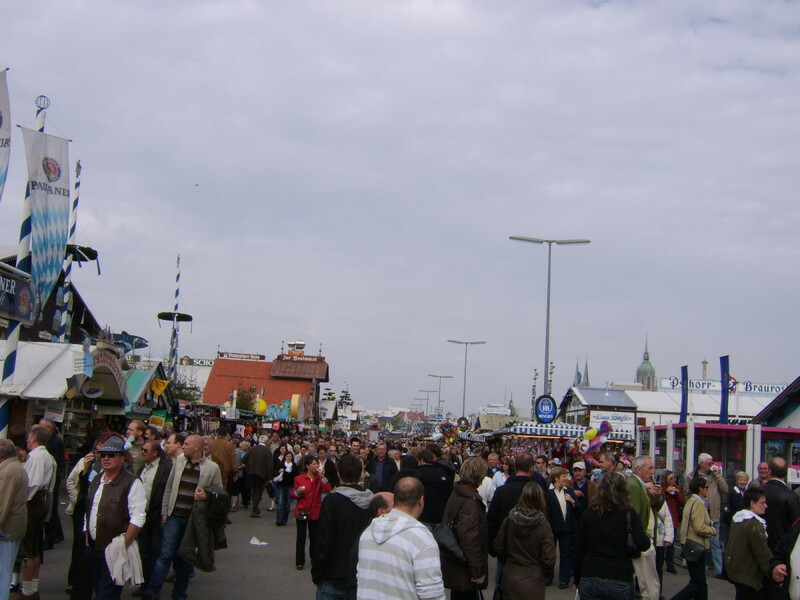 Latest figures for the numbers of visitors to Oktoberfest each year are now verging upon seven million! Oktoberfest is not only about beer - even though that is of course its prime concern. 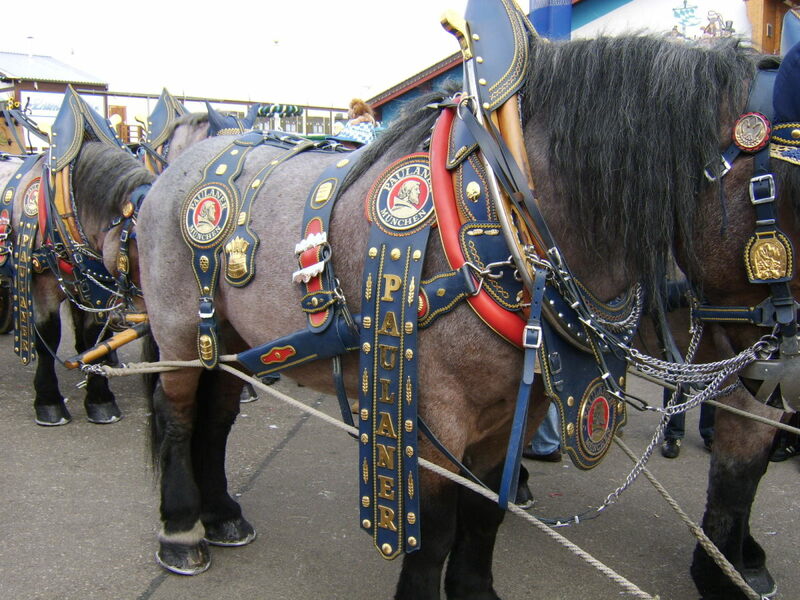 There are a great many fairground rides, food stalls and outlets and always something interesting and unique to see. 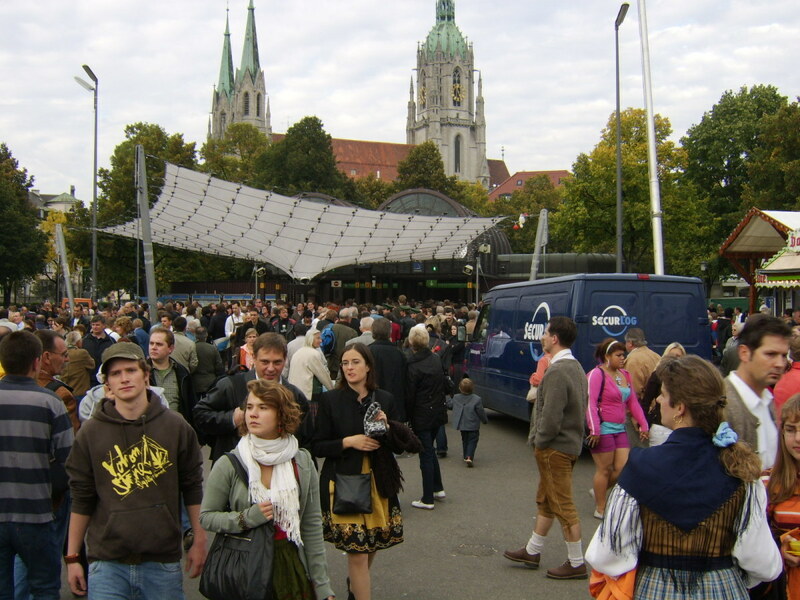 Its popularity alone means that Oktoberfest is almost always going to be busy. At all times at weekends and every evening, trying to simply move through the crowds at Oktoberfest can be difficult. Obtaining a seat in or around one of the beer tents can be nigh on impossible, particularly as many of them take block business bookings. 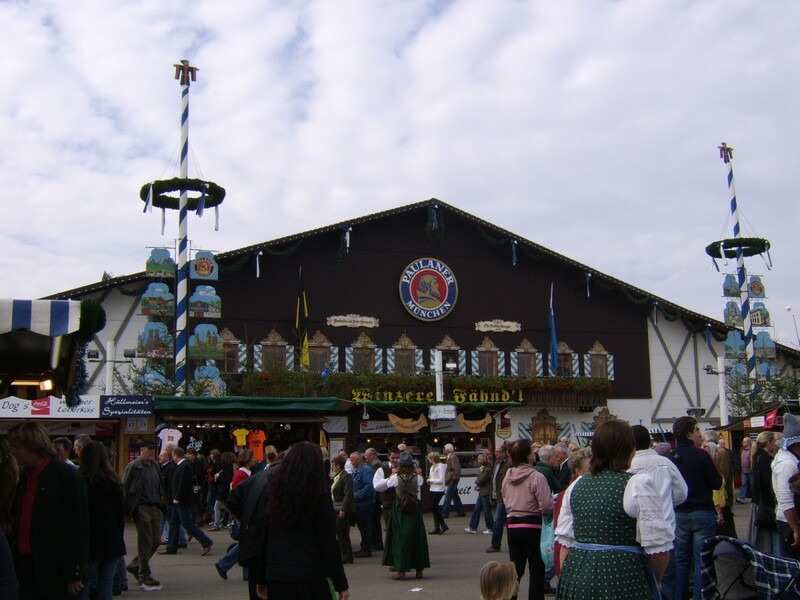 If you really want to be able to see all that is going on at Oktoberfest, therefore, and explore unhindered, try to go as early after its 10.30am opening time on a weekday as possible. 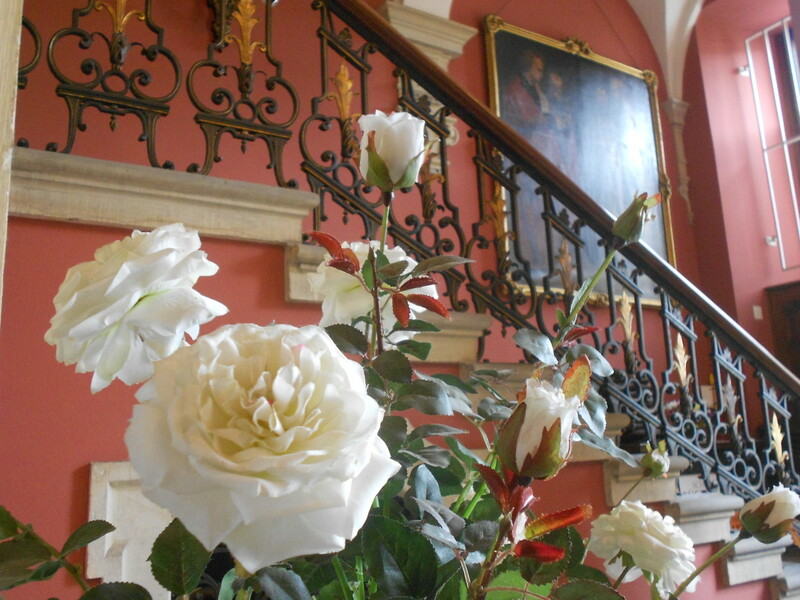 You may not find the same atmosphere but this will allow you to get the feel of the layout, perhaps even by way of preparation for a further visit at a more popular time. 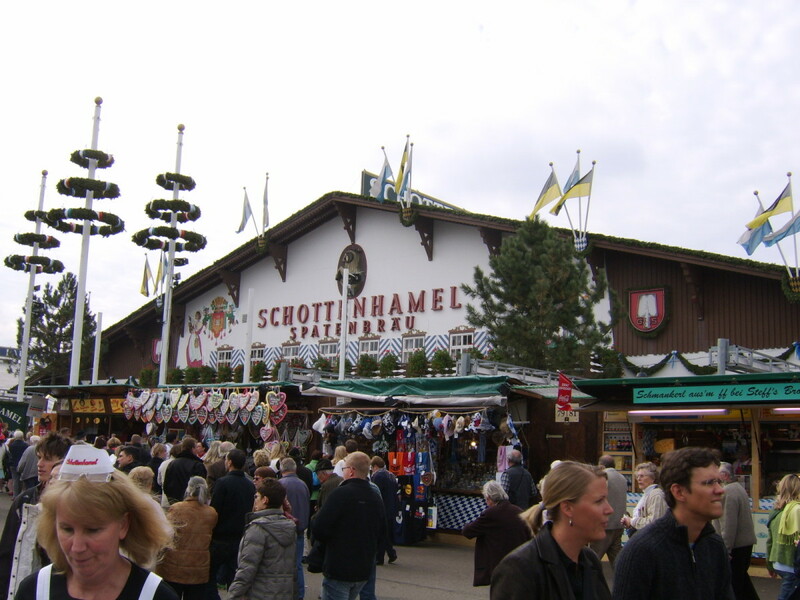 Particularly where you are visiting with children, identify an extremely prominent landmark at the time of entering Oktoberfest and make that your prearranged meeting point in the event of accidental separation. It really can be so busy that no matter how careful you are, separation can happen. Oktoberfest is sadly becoming more and more expensive every year. Where such costs are related to the food and drink, there is little choice to be had, other than doing without. Where the cost relates to souvenirs, however, you may be better advised to try picking up what you require elsewhere in the city...or even from eBay after you get home! Welcome to Oktoberfest! 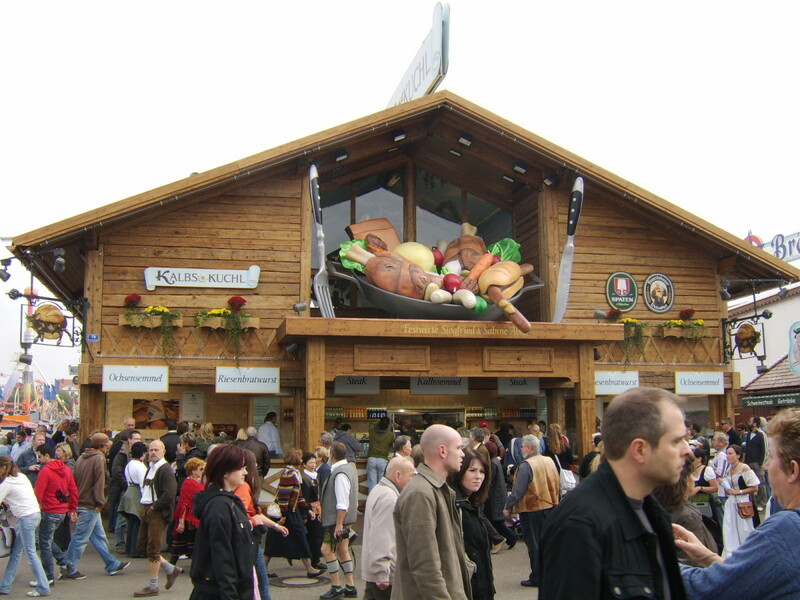 Theresienwiese U-Bahn Station during a "Quieter" period at Oktoberfest! Some solids are a good idea before Oktoberfest bier. Fish and chips, anyone? Trying to Find Oktoberfest? Follow the Crowds! Something to Eat with your Beer? Drinking beer, or any form of alcohol, on an empty stomach is never a good idea. It is important, therefore, to have some sustenance of the solid variety either before or while enjoying the best beers that Munich has to offer. Below (and pictured to the right) are just a few simple ideas. 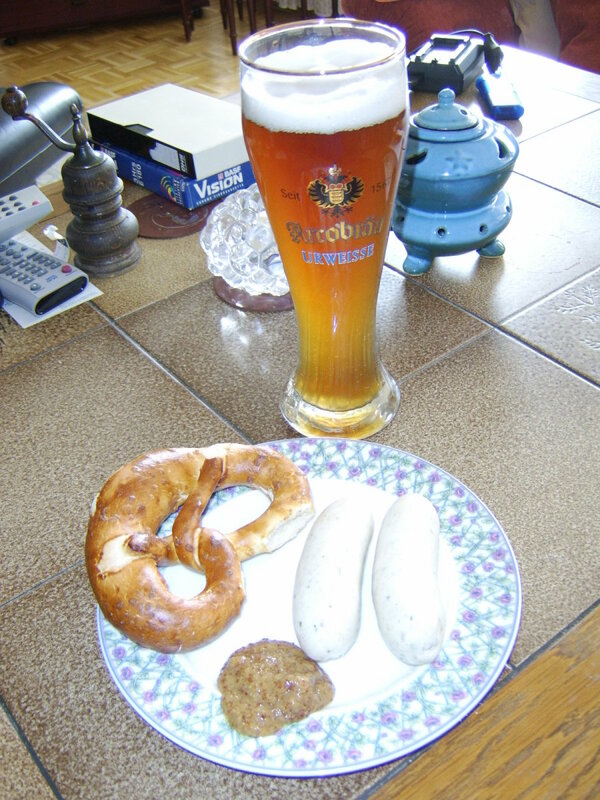 This is a traditional Bavarian breakfast. (Yes, beer is widely consumed at breakfast in Munich.) These white sausages are extremely tasty and are very much a dedicated breakfast dish. They are unusual in that you should remove the skin before eating them and eat only the content. 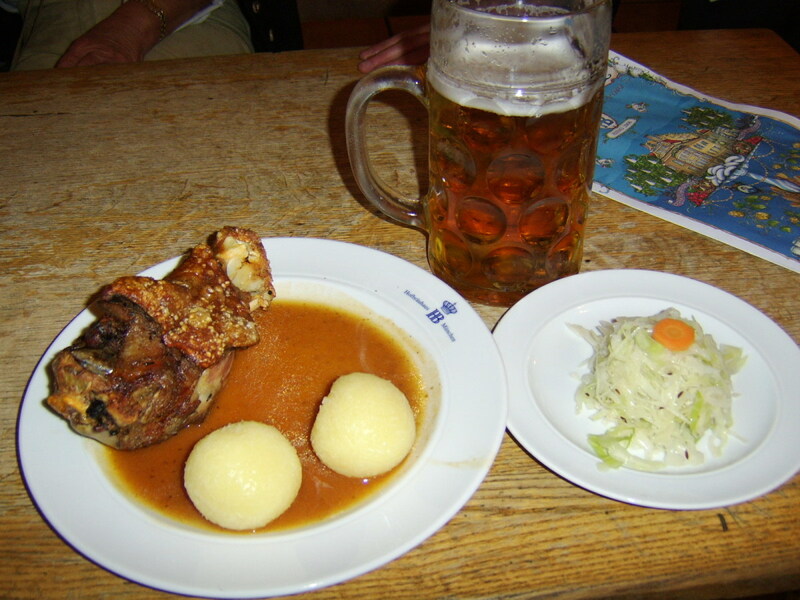 They are normally served with a bretze (a type of bread,) a delicious sweet mustard and a weissbier. 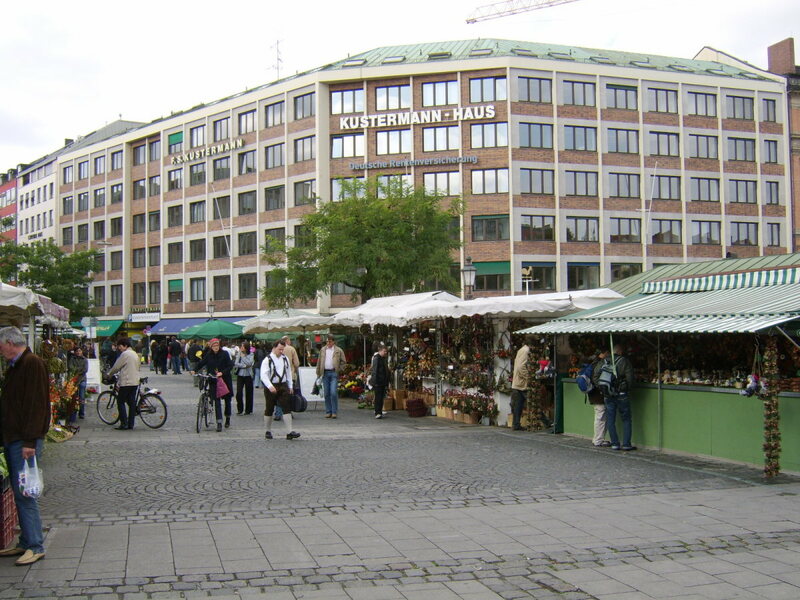 The Viktualienmarkt stalls (as mentioned earlier) afford a wide variety of foodstuffs of all types. 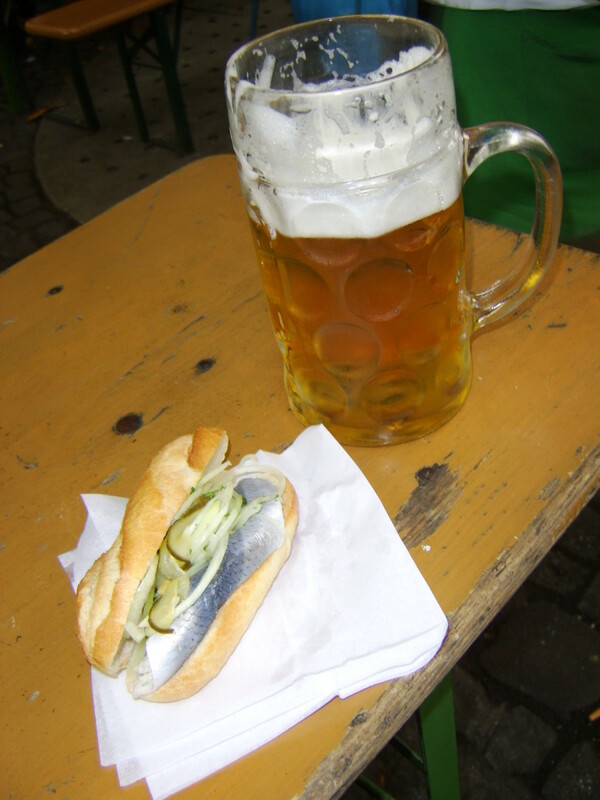 The pickled herring on a semmel (bread roll) makes a particularly delicious lunch, however, accompanied by a mass (litre) of helles. 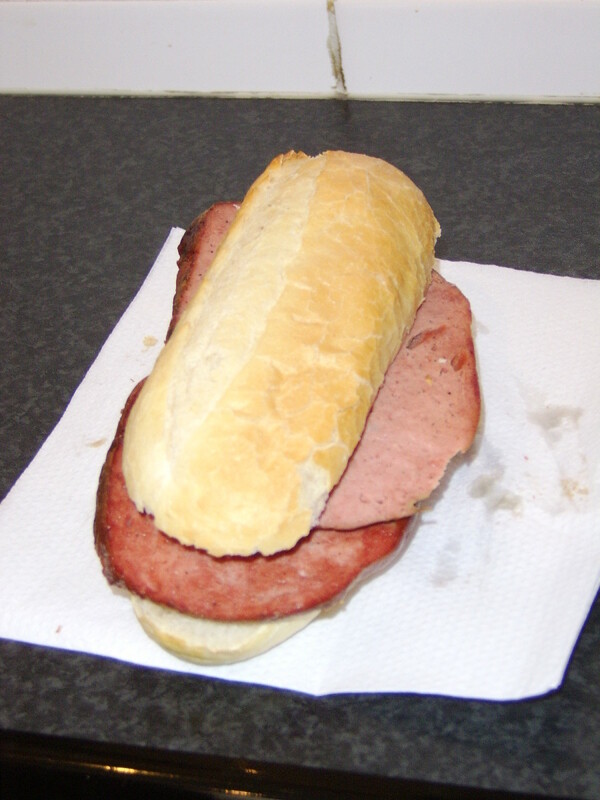 Leberkase can be served in many different ways. It is easiest to describe as a form of meat loaf, where all the ingredients have been smoothly blended and it is then baked to form a crisp and delicious outer skin. Unless you happen to be vegetarian, you cannot let your visit to Munich pass without sampling at least one schweinhax'n. This is a roasted knuckle of pork and is cooked in such a way as to be absolutely beyond delicious. Fortunately, schweinhax'n are widely available around Munich but be careful when perhaps comparing prices to determine what size you are actually getting for your money beforehand. A great many of the larger restaurants and beer halls in Munich will have menus in the English language. Unfortunately, these translated menus are occasionally not quite of the standard they should be and it can happen that what you receive is not exactly what you thought you had ordered and expected. It can therefore be a good idea to exercise caution in this respect and seek polite clarification where possible, ideally from an English speaking server. Just like the beer, however, the food in Munich is of a very high standard and taking the time to investigate the local preferences and delicacies and actually giving them a try can pay handsome dividends. Where would you prefer to enjoy a beer in Munich? 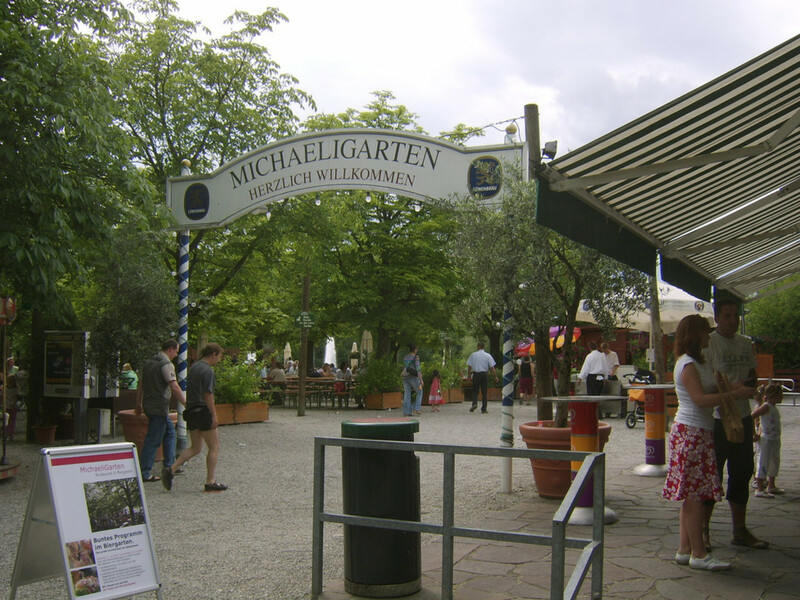 A biergarten in a large park like Michaeligarten in the Ostpark? 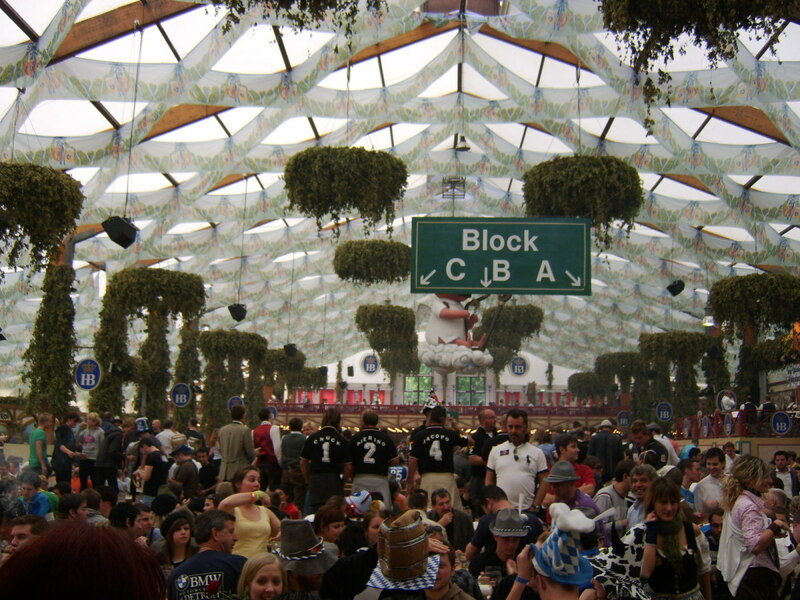 An urban biergarten such as that on the Viktualienmarkt? A large beer hall like the Hofbrauhaus? It has to be Oktoberfest!!! Somewhere else, such as a smaller scale, quieter restaurant or bar? 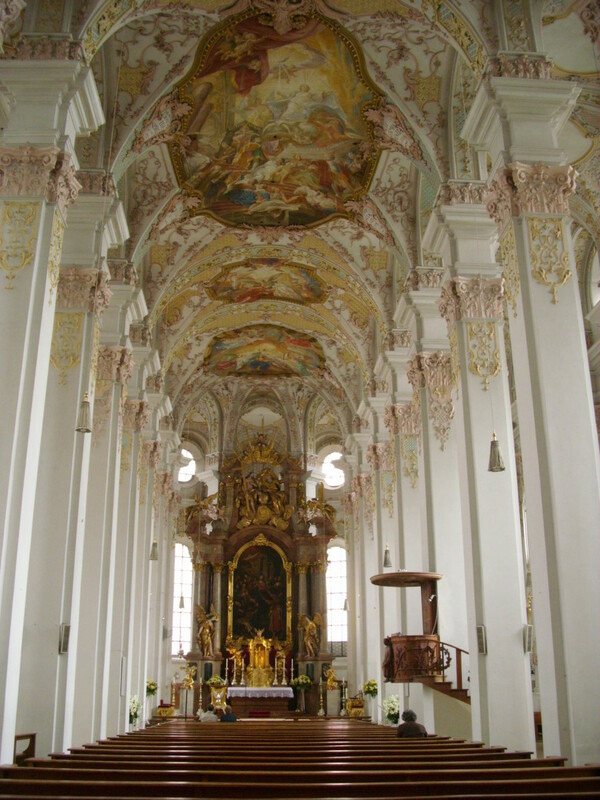 Have you ever been to Munich? What did you make of the beer? Thanks, Larry. I'll check it out, ASAP. John, Just want to mention that a newer edition is now available for the BDG2M, published in May 2015. The 7th edition has new beer gardens and more free-coupons than ever before. Thanks, John! I'm glad you've had the opportunity to experience Oktoberfest. I hope you get the chance to visit at another time of year in the future to experience some of the other delights on offer in this magnificent city. Oktoberfest was one of the best things I had the pleasure to experience in my life! I tried over 40 types of local beer over there, during a 2 weeks long trip and not a single one of them was less than very good. I've never experienced a hangover while in Germany, either (despite having drank quite a lot :) )! Hi, Suzette. I'm glad you've had the chance to experience the delights of this beautiful city for yourself. I have visited many times and look forward to many more visits in the future. I also enjoy a glass of wine, wherever I happen to be, but the beer definitely does it for me in Munich. Thanks for stopping by and taking time to share your info about the region. Hope you get to visit again soon! Oh my gosh! 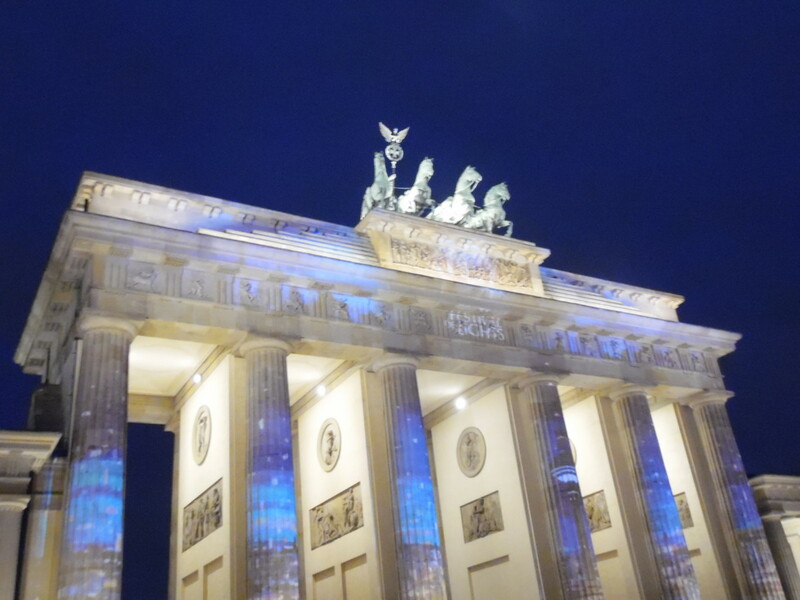 Your hub brought back such wonderful memories of Munich, Germany. I lived in Wurzburg for a year back in the 80's and have been to the beer gardens, hofbrauhaus, and Oktoberfest in Munich. Your photos are beautiful and wonderful. Looks like you had a great time too. I actually learned more about German beer from your hub than when I lived in Germany. I am more of a wine drinker than beer drinker and Wurzburg is in the Franken wine region of Germany, but I certainly always appreciated the German beer. I enjoyed reading this so much - very informative and full of great knowledge. Thanks for the visit and comment. I hope you do get to Munich soon but remember that there is a lot more to Munich than Oktoberfest. It is possible to have a great time in the city at any time of year. Awesome hub! 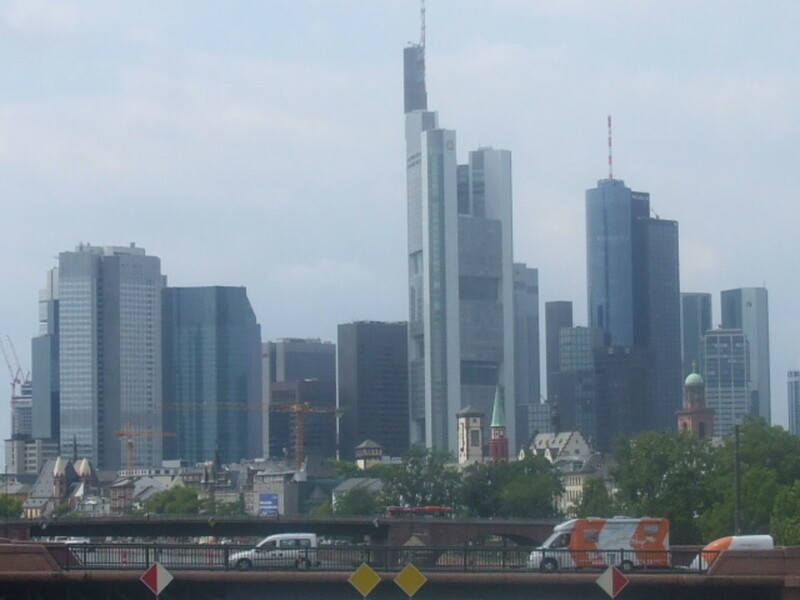 Looking forward to a Germany trip soon. Most likely Oktoberfest!! Munich is my favorite city... I absolutely love the Viktuellenmarkt Biergarten on a sunny day... and even though I go to Munich a lot and have lived in the region before, I have (to my recollection) never been to Ostpark. Prost! 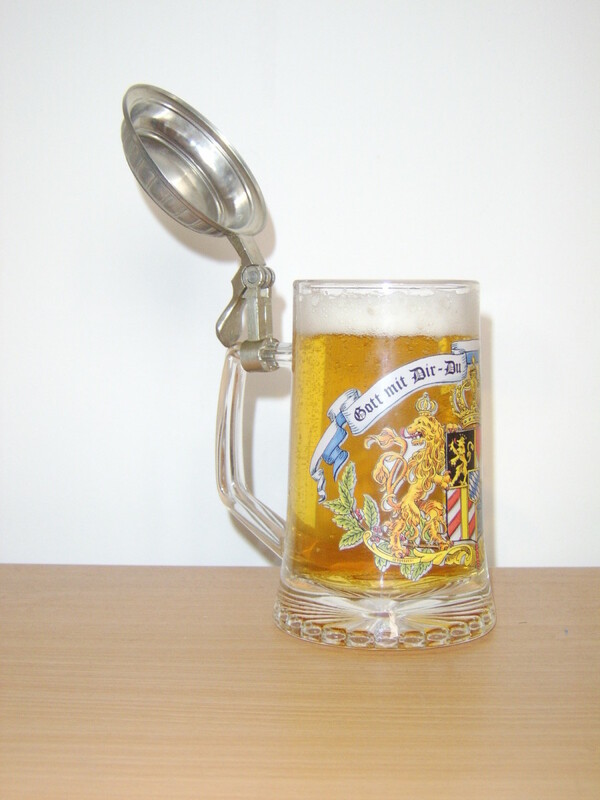 What a fantastic guide to beer-drinking in Munich! Congratulations on your contest win. Looks like Oktoberfest is something I have to get to some day! Great Hub. 8 years ago from South Valley Stream, N.Y. Fantastic hub, Gordon Hamilton, and very well done. I had only a brief visit to Munich on a three-day pass while serving the U.S. Army in Heilbronn, Germany. I had intended to go to Amsterdam but switched to Munich when there were no trains heading that way from Stuttgart that day. I visited one of the museums on the outskirts of Munich and had a great time. I can testify that there's no better beer than that served in Germany, but I missed out on the biergarten scene. 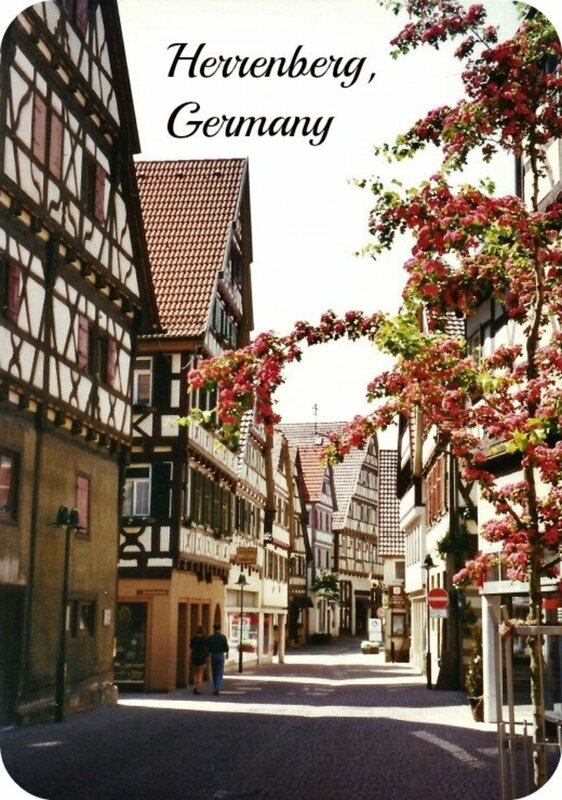 If I ever get a chance to visit Europe Germany is near the top of my list right under Ireland. Great Hub Gordon Hamilton! The pictures really tell the story, everyone looks like they are having a great time! But with all the choices on beer, who wouldn't? This is a wonderful hub, great job! No one will be suffering in Munich, for a great beer. Rebekah - thank you. Oktoberfest really is a lot of fun. I really hope that you get the chance to experience it for yourself. Gordon - thanks. Prost!! I should have explained that typical Bayerisch toast on the site! James - here in the UK I always drink dark beer, known as, "Heavy," in Scotland or, "Bitter," in England. Munchener bier - as I am sure you know - is very different. You are certainly right about the young ladies and the biers - I misremember the record at the moment for carrying them but I will find out for you. Please do try the outdoor biergartens of Munich - I don't believe that you will be disappointed!! I enjoyed your Hub very much. I prefer dark beer. I have been to the Hofbrauhaus. It is amazing how the waitresses hold so many of the huge beer mugs at one time. The outdoor garden looks dreamy. I'll do that next time. Prost! Cheers! A great site and a great topic. 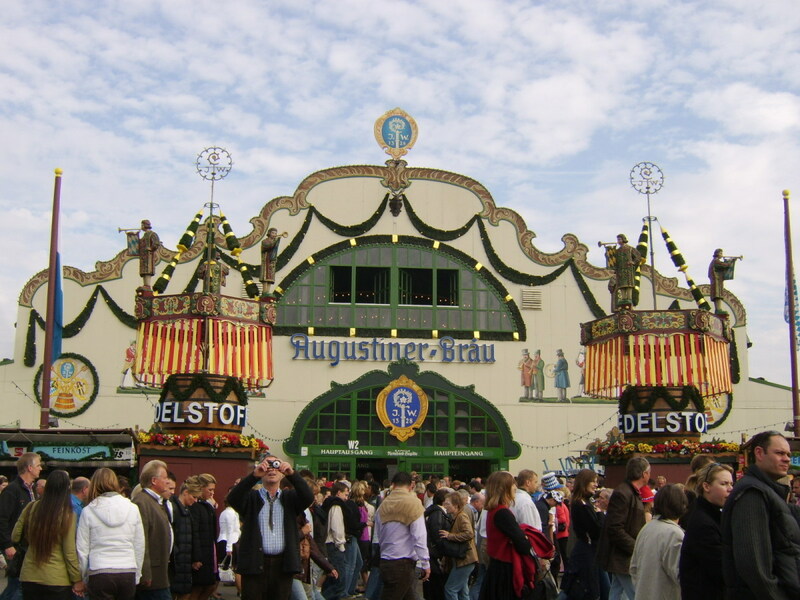 Anyone who has been to Oktoberfest will rcognise its value. Those who haven't, really should leave home without it. Good job. wow, what an impressive and informative hub! 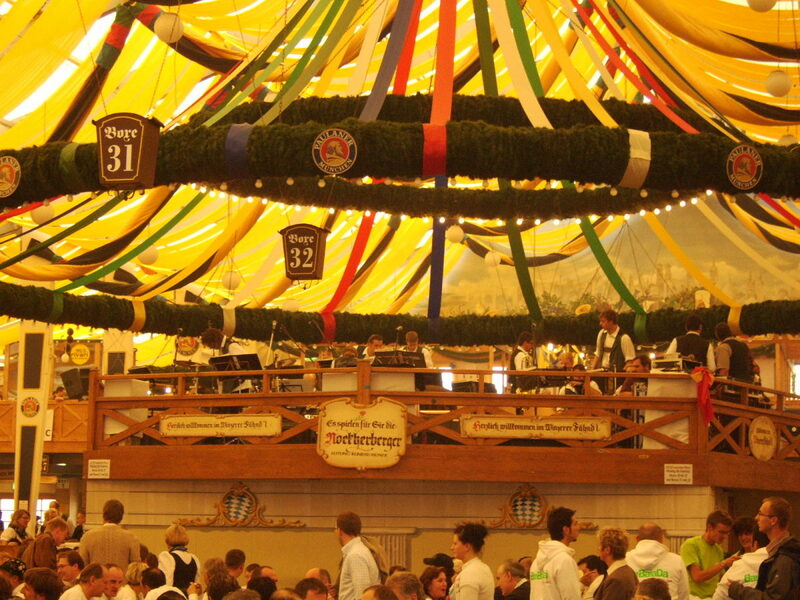 a real Oktoberbest in Munich sounds like so much fun. now I'm hungry and thirsty! great job! Wonderfully complete hub on beer. Are you an enthusiast, I wonder? Thank you, Purple Perl. Oktoberfest is of course an incredible occasion but don't forget that there is a lot more to the beautiful city of Munich and it is worth visiting at any time of the year. I have heard so much about the Oktoberfest. And you have given some very important tips. Hope to visit some day, though I do not drink. Thank you, PhoenixV. This award makes up in a lot of ways for the fact that various circumstances prevent me from making it to Munich for Oktoberfest this year. I hope the page helps others to have a great deal of fun. Excellent Hub and wow! Great job and congratulations! Gordon Hamilton, you have absolutely blown me away. The preliminary discussion of beer and beer types in Germany, the breakdown of beer-serving venues in the city, the use of slide-shows and video, and convenient interspersed maps throughout the hub for convenience and easy reference are... well, I want to print this thing and give it to all of my friends! I can't wait to share this around. I'm sure this hub shall prove to be a GREAT guide to visitors over many years.